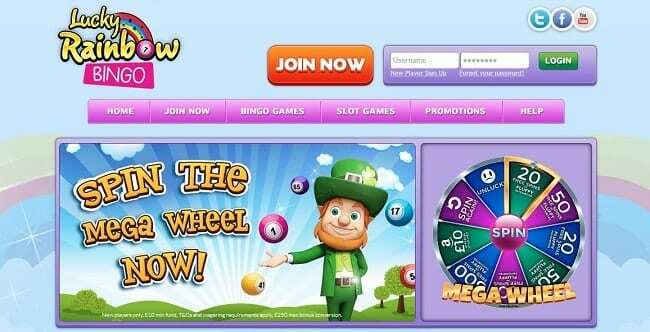 Spinning the wheel and hoping on the luck of the leprechaun, Lucky Rainbow Bingo was newly launched in 2014. Rodger the Leprechaun welcomes any players with the big time sign-up bonus that catches the attention of many. You can get a bonus of up to 500 free spins when you join this site. Lucky Rainbow Bingo offers a selection of different games along with great bonuses and promotions. The site is quite exclusive to registered players since navigating through the website as a visitor doesn’t give you much on what is in store for you but rather just teasers of what lay beyond the rainbow. Bingo has never been better with added games put into the lot. The website is filled with multiline slot games, table games scratch cards and instant games to win extra cash for playing. The site offers what 75 and 90 ball bingo games can offer. Not only can gamers play these two big bingo games, the site also offers casino games and scratch cards. The site offers a selection of Video Bingo that would give you a nice virtual bingo gaming experience that you would never experience elsewhere. When you sign up to this site you’ll get the chance to spin the wheel and win up to 500 free spins. This is a really fun way of getting your welcome bonus, and it’s similar to promotions on many other sites. The Bingo Site provides regular promotions to returning and loyal players. It provides multiple gaming opportunities for any player to enter different promotional games. They have weekly promotional games like ‘Monday Madness’, ‘Weekend Wad’ and ‘Friday Night Takeaway’ to bring a spin to their player’s week by adding something to look forward to every week. The game site also offers special promotions on their VIP Scheme allowing a loyal player to get re-deposits, monthly cashbacks and even birthday bonuses. The site has regular giveaways to any type of player ranging from beginners to regular players to loyal gamers. Launched by 15 Network and operated by Jumpman Gaming Limited, the big balls in Bingo balls, this bingo site is made for bingo lovers out there. It has a user-friendly website that leads any player around the website with easy locator tabs for different games in the gaming lobby. The website is made simple by tab units to entertain the different needs of the players. Rodger the Leprechaun is the main icon of the site. The site may not be as eye-catching as other websites but the games are made-to-attract because it maximizes virtual gaming by giving you the Video Bingo. Check out our Zingo Bingo review to see another brand from the same software provider. Yes, it can be played on your mobile! Lucky Rainbow bingo site is full of surprises both on your computer and your mobile device. It does, however, work best in the Google Chrome Browser but nonetheless, can be played by other web browsers all the same. Several mobile friendly bingo sites are now available online and you can sign up and use these through your smartphone or tablet. If you have found our Lucky Rainbow Bingo review helpful, why not sign up to the site yourself and give it a go? You can claim their latest welcome bonus and play a variety of top games.